Above, a row of 13 maisonettes forms an unbroken street elevation atop sundry urban functions. Below, on either side of a gateway are a clubhouse and a school which extends back into the courtyard. Next to the school is a gymnasium with a glass brick skin. The external glazing is held clear of the concrete frame at various points. Colour, use of materials and finish (staircases, balustrading, void, letter boxes and name-plates) add a modern (or postmodern) touch. 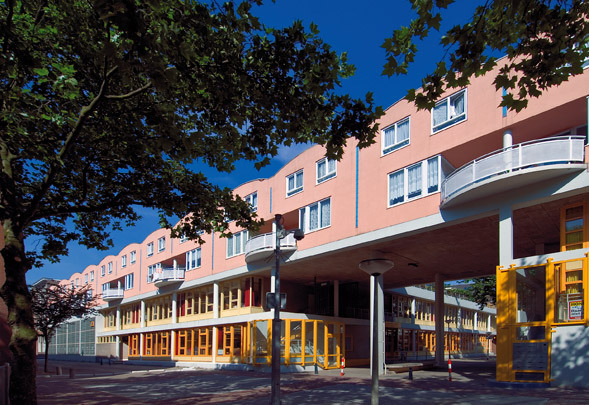 The project is part of the renewal of the Oude Westen.